Twisters Series, by Su Swallow and Simona Dimitri. 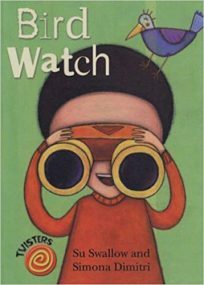 This is a series for early readers and is about a bird watching expedition by Ben and his dad. The text is very simple, a maximum of five words per page, with attractive illustrations which include a variety of birds to be recognised.